Map of Pangaea with modern continental outlines. Simplistic representation of the supercontinent cycle to modern day. The most recent supercontinent, Pangaea, formed about 300 million years ago (0.3 Ga). There are two different views on the history of earlier supercontinents. 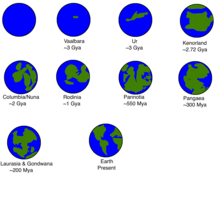 The first proposes a series of supercontinents: Vaalbara (c. 3.6 to c. 2.8 billion years ago); Ur (c. 3 billion years ago); Kenorland (c. 2.7 to 2.1 billion years ago); Columbia (c. 1.8 to 1.5 billion years ago); Rodinia (c. 1.25 billion to 750 million years ago); and Pannotia (c. 600 million years ago), whose dispersal produced the fragments that ultimately collided to form Pangaea. The second view (Protopangea-Paleopangea), based on both palaeomagnetic and geological evidence, is that supercontinent cycles did not occur before about 0.6 Ga (during the Ediacaran Period). Instead, the continental crust comprised a single supercontinent from about 2.7 Ga (Gigaannum, or "billion years ago") until it broke up for the first time, somewhere around 0.6 Ga. This reconstruction is based on the observation that if only small peripheral modifications are made to the primary reconstruction, the data show that the palaeomagnetic poles converged to quasi-static positions for long intervals between about 2.7–2.2, 1.5–1.25 and 0.75–0.6 Ga. During the intervening periods, the poles appear to have conformed to a unified apparent polar wander path. Thus the paleomagnetic data are adequately explained by the existence of a single Protopangea–Paleopangea supercontinent with prolonged quasi-integrity. The prolonged duration of this supercontinent could be explained by the operation of lid tectonics (comparable to the tectonics operating on Mars and Venus) during Precambrian times, as opposed to the plate tectonics seen on the contemporary Earth. The kinds of minerals found inside ancient diamonds suggest that the cycle of supercontinental formation and breakup began roughly 3.0 billion years ago (3.0 Ga). Before 3.2 billion years ago only diamonds with peridotitic compositions (commonly found in the Earth's mantle) formed, whereas after 3.0 billion years ago eclogitic diamonds (rocks from the Earth's surface crust) became prevalent. This change is thought to have come about as subduction and continental collision introduced eclogite into subcontinental diamond-forming fluids. The hypothesized supercontinent cycle is overlaid by the Wilson cycle named after plate tectonics pioneer J. Tuzo Wilson, which describes the periodic opening and closing of ocean basins from a single plate rift. The oldest seafloor material found today dates to only 170 million years old, whereas the oldest continental crust material found today dates to 4 billion years, showing the relative brevity of the regional Wilson cycles compared to the planetary pulse seen in the arrangement of the continents. where d is in meters and t is in millions of years, so that just-formed crust at the mid-ocean ridges lies at about 2,500 m depth, whereas 50-million-year-old seafloor lies at a depth of about 5,000 m.
As the mean level of the sea floor decreases, the volume of the ocean basins increases, and if other factors that can control sea level remain constant, sea level falls. The converse is also true: younger oceanic lithosphere leads to shallower oceans and higher sea levels if other factors remain constant. The surface area of the oceans can change when continents rift (stretching the continents decreases ocean area and raises sea level) or as a result of continental collision (compressing the continents increases ocean area and lowers sea level). Increasing sea level will flood the continents, while decreasing sea level will expose continental shelves. Because the continental shelf has a very low slope, a small increase in sea level will result in a large change in the percent of continents flooded. If the world ocean on average is young, the seafloor will be relatively shallow, and sea level will be high: more of the continents are flooded. If the world ocean is on average old, seafloor will be relatively deep, and sea level will be low: more of the continents will be exposed. There is thus a relatively simple relationship between the supercontinent cycle and the mean age of the seafloor. During break-up of the supercontinent, rifting environments dominate. This is followed by passive margin environments, while seafloor spreading continues and the oceans grow. This in turn is followed by the development of collisional environments that become increasingly important with time. First collisions are between continents and island arcs, but lead ultimately to continent-continent collisions. This is the situation that was observed during the Paleozoic supercontinent cycle and is being observed for the Mesozoic–Cenozoic supercontinent cycle, still in progress. There are two types of global earth climates: icehouse and greenhouse. Icehouse is characterized by frequent continental glaciations and severe desert environments. Greenhouse is characterized by warm climates. Both reflect the supercontinent cycle. It is now a short greenhouse phase of an icehouse world. Periods of icehouse climate: much of Neoproterozoic, late Paleozoic, late Cenozoic. Periods of greenhouse climate: Early Paleozoic, Mesozoic–early Cenozoic. The principal mechanism for evolution is natural selection among diverse populations. As genetic drift occurs more frequently in small populations, diversity is an observed consequence of isolation. Less isolation, and thus less diversification, occurs when the continents are all together, producing both one continent and one ocean with one coast. In Latest Neoproterozoic to Early Paleozoic times, when the tremendous proliferation of diverse metazoa occurred, isolation of marine environments resulted from the breakup of Pannotia. A north–south arrangement of continents and oceans leads to much more diversity and isolation than east–west arrangements. North-to-south arrangements give climatically different zones along the communication routes to the north and south, which are separated by water or land from other continental or oceanic zones of similar climate. Formation of similar tracts of continents and ocean basins oriented east–west would lead to much less isolation, diversification, and slower evolution, since each continent or ocean is in fewer climatic zones. Through the Cenozoic, isolation has been maximized by a north–south arrangement. Diversity, as measured by the number of families, follows the supercontinent cycle very well. ^ Zhao, Guochun; Sun, M.; Wilde, Simon A.; Li, S. Z. (2004). "A Paleo-Mesoproterozoic supercontinent: assembly, growth and breakup". Earth-Science Reviews. 67 (1–2): 91–123. Bibcode:2004ESRv...67...91Z. doi:10.1016/j.earscirev.2004.02.003. ^ a b Piper, J. D. A. (2013). "A planetary perspective on Earth evolution: Lid Tectonics before Plate Tectonics". Tectonophysics. 589: 44–56. Bibcode:2013Tectp.589...44P. doi:10.1016/j.tecto.2012.12.042. ^ Piper, J. D. A. (2013). "Continental velocity through geological time: the link to magmatism, crustal accretion and episodes of global cooling". Geoscience Frontiers. 4: 7–36. doi:10.1016/j.gsf.2012.05.008. ^ Shirey, S. B.; Richardson, S. H. (2011). "Start of the Wilson Cycle at 3 Ga Shown by Diamonds from Subcontinental Mantle". Science. 333 (6041): 434–436. Bibcode:2011Sci...333..434S. doi:10.1126/science.1206275. PMID 21778395. ^ E. E., Davis; Lister, C. R. B. (1974). "Fundamentals of Ridge Crest Topography". Earth and Planetary Science Letters. 21 (4): 405–413. Bibcode:1974E&PSL..21..405D. doi:10.1016/0012-821X(74)90180-0. ^ Parsons, Barry; Sclater, John G. (1977). "An analysis of the variation of ocean floor bathymetry and heat flow with age". Journal of Geophysical Research. 82 (B5): 802–827. Bibcode:1977JGR....82..802P. doi:10.1029/jb082i005p00803. ^ Read, J. Fred (2001). "Record of ancient climates can be a map to riches". Science from Virginia Tech. Retrieved 2011-05-04. ^ Benton, Michael J. (23 September 2005). Fossil Record: Quality. eLS (Encyclopedia of Life Sciences). John Wiley & Sons, Ltd. doi:10.1038/npg.els.0004144. ISBN 978-0470016176. Gurnis, M. (1988). "Large-scale mantle convection and the aggregation and dispersal of supercontinents". Nature. 332 (6166): 695–699. Bibcode:1988Natur.332..695G. doi:10.1038/332695a0. Murphy, J. B.; Nance, R. D. (1992). "Supercontinents and the origin of mountain belts". Scientific American. 266 (4): 84–91. Bibcode:1992SciAm.266c..84M. doi:10.1038/scientificamerican0492-84. Nance, R. D.; Worsley, T. R.; Moody, J. B. (1988). 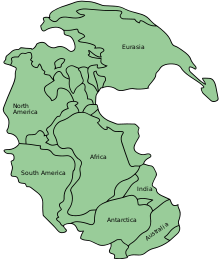 "The supercontinent cycle". Scientific American. 259 (1): 72–79. Bibcode:1988SciAm.259a..72N. doi:10.1038/scientificamerican0788-72. This page was last edited on 20 February 2019, at 19:05 (UTC).